The lowly Toaster Oven has really matured over the years. I remember mine in college, a lowly metal box, good only for melting cheese on toast and the formica counter beneath it. Today's models can replace your standard oven quite practically, for all but the largest baking and roasting needs. Case in point, this Cuisinart Convection Oven. Very sleek looking and high-tech, this oven has a generous capacity interior that will accommodate a frozen pizza, a pan of muffins or cookies, you name it. The extensive electronic control panel puts all the settings in easy reach, although some may find it a bit over-complicated for just making toast. Honestly, toast? Plenty of cooking power, 1500 watts heat this sucker mighty fast when you need that pizza like, now. Although I find the convection feature overkill on an oven of this size. It is basically a fan that circulates the hot air to bake items faster and more evenly, and in turn burn items that much sooner if you're not paying attention. You may find it a very useful feature though, I'm not one to judge. This oven lacks one simple feature however- an interior light. The glass door does not help you see the food inside very well without it. 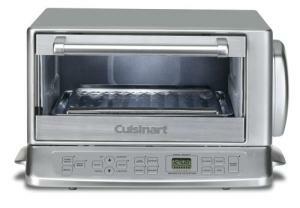 One other thing- Cuisinart advertises this Toaster Oven as Stainless Steel. In reality it is silver painted metal, with Stainless Steel accents and trim. Not what one would expect with that description. They may upgrade the unit yet, after enough angry calls to customer service. We'll see. For the classic toaster approach, try the Breville Ikon Toaster.